Cambridge China Centre is going from strength to strength since its launch in June. The Centre facilitates interaction and collaboration between members, driving long-term UK|China business relationships. The UK is at a pivotal point in its history, turning its attention to the global stage, and in doing so is looking to China with great potential. The UK government has set out the intention to be the best place to start and grow a business in the world “As at September 2017, over £350million has been invested in 243 technology companies through the British Business Bank’s venture capital programmes” (www.gov.uk policy paper – AI Sector Strategy), with Cambridge at the heart of UK technology growth. China has faced challenges in the fields of high-tech and international talent following decades of rapid economic growth. According to the World Economic Forum, China now accounts for one-third of global growth, with the Chinese government focussing on high-quality growth. Based in Cambridge and founded by Jinzhao Li together with co-founders Sophie Yang, Jiajin Wang and Weimin Li, Cambridge China Centre facilitates and drives mutually prosperous UK|China business relationships. Managing Director Jinzhao Li has two decades’ experience in international Education, Culture and Tourism sectors, including a senior management role with the world’s largest education group (New Oriental Education & Tech Grp, NYSE: EDU). In 2012 she founded, the respected First UK Education and Tourism Ltd, who deliver regular high-level tours from China to Cambridge. Her company is well respected in Cambridge for creating credible, well researched and curated projects, courses and tours to the city and beyond. Jinzhao now brings this extensive experience of UK|China business relationships to Cambridge China Centre. When we envisaged Cambridge China Centre, we wanted to build on our expertise in the international education, culture and tourism sectors, and extend this reputation to connect entrepreneurs, governments and business associates, and give members opportunities to transfer knowledge, drive opportunities, build relationships as well as creating a powerful UK/China business network. While supporting a broad spectrum of industries and sectors, we are now able to enable key opportunities in three areas: 1. business, science and technology, 2. retail, leisure and tourism, and 3. education. 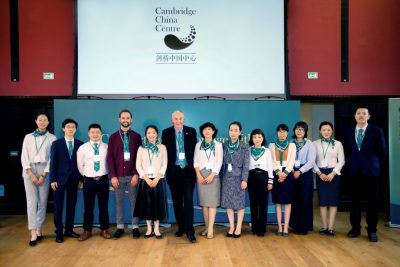 As a membership organisation, Cambridge China Centre offers members monthly culture events, quarterly networking events, an annual business forum, job postings, and cross-cultural business support. To become a member of Cambridge China Centre please contact the team via enquiry@cambridgechinacentre.org.